Richard Gere resurfaces, only to be trapped in an atonal crime drama that picks the wrong time and place to ask audiences to root for a Wall Street banker — one trying to cover up manslaughter and shady business dealings, no less. Admittedly, Gere is in fine form, it’s too bad his is a great performance in an otherwise half-baked movie. The actor stars as Robert Miller, a successful hedge fund magnate who is for all intents and purposes appears to be living the high-life: He’s introduced celebrating his birthday with his wife (Susan Sarandon) and daughter Brook (Brit Marling) in a swank Long Island home; he later sneaks out to visit his temperamental French artist girlfriend Julie (Laetitia Casta). Things are much uglier beneath the surface. Miller is on the verge of bankruptcy thanks to creative (read: illegal) money manipulation, something that could land him in prison if he doesn’t come up some quick cash. His late-night trysts with Julie result in her death when Miller falls asleep at the wheel. Despite his attempts to hide his involvement in the latter, NYPD detective Bryer (Tim Roth) is soon barking at his heels, as is Brook, whose job as daddy’s CFO has tipped her off to his shady business dealings. There’s nothing wrong with a good anti-hero or fun villain, but alas writer-director Nicholas Jarecki gives us a lead character who is neither, instead putting for a man almost completely morally bankrupt and insisting that we feel pity for him. 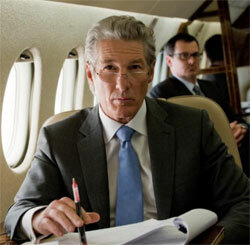 Thanks to Gere, Miller’s desperation is palpable; thanks to Jarecki, his douchey-ness is overwhelming. As an examination of the psychology of self-destruction it never gets deep enough into Miller’s head to explain the man. In the long run, it’s only entertaining if one views it as an ersatz pseudo-sequel to Pretty Woman with Miller as Edward Lewis gone to seed. Its mid-stream genre switch also works against it, with both the ripped-from-the-headlines financial hijinks and tepid crime thriller threads failing to deliver much in the way of compelling drama, and its phony moralism just doesn’t sell.